The witness in the interview was subjected to a polygraph test (lie detector) which corroborated veracity of his testimony. The interview below was conducted by Vladimir Sungorkin, Dmitry Steshin, & Nikolay Varsegov. The video was posted on YouTube 22 December 2014. Translated from Russian by Kristina Rus for FortRuss.blogspot.com. Originally published in Russian by Komsomolskaya Pravda. In the “case of Malaysian Boeing” a “secret witness” stepped forward whose testimony remove all charges from the militia and Russia. And explain the mysterious behavior of Western experts. – Where were you on July 17, 2014, the day Malaysian Boeing was shot down? – I was on the territory of Ukraine, in the city of Dnepropetrovsk, the village Aviatorskoye. It is a regular airport. There at this time were based fighter jets and helicopters. Planes regularly flew on bombing missions, Su-25 attack aircraft bombed Donetsk, Lugansk. This lasted a long time. – The aircraft flew every day? – Why did you assume that these airplanes could be related to the downing of the “Boeing”? – A few reasons. Out of the eight airplanes, which were based there, only two had “air-to-air” missiles. They were suspended. – Why? Were there any aircraft battles in the air? – No, the aircraft was fitted with missiles to cover themselves in the air. Just in case. Mostly they had air-to-ground ammunition. NURS, bombs. -Tell us about July 17. – Airplanes flew regularly. All day since the morning. In the afternoon, about an hour before the downing of the “Boeing”, three attack fighters were raised into the air. I don’t remember the exact time. One of the airplanes was equipped with such missiles. It was a Su-25. – Have you personally seen it? – Where was your vantage point? – On site. Cannot tell you exactly. – Did you have an opportunity to see specifically what the pylons of the aircraft where fitted with? Could you confuse “air-to-air” and “air-to-ground” missiles? – No, I couldn’t confuse it. They vary in size, plumage, coloration. With a guidance head. Very easy to recognize. Anyway, after a short time, only one airplane returned, two were shot down. Somewhere in the East of Ukraine, I was told. The airplane that came back, was the one with those suspended missiles. – It returned without the missiles? – Without the missiles. That pilot was very scared. – Do you know this pilot, have you seen him? – Can you tell us his name? – Was he alone in the airplane? – Yes. The airplane is designed for one person. – Do you know his name? – Vladislav, I think. Don’t remember exactly. Captain. – Captain Voloshin came back. What happened next? – Came back with blank ammunition. – Could you tell us, Alexander, the airplane came back from the mission, you still do not know about the loss of the “Boeing”, but you were somehow surprised by the absence of “air-to-air” missiles. Why? – These “air-to-air” missiles are not included in the basic ammunition package. They are used only with a special order. Typically, the aircraft with such rockets were not to allowed into the air. Because this missiles should not be frequently transported in the air. In all two such missiles can fit on this plane. Never before they had been applied. They were written off previously. But literally on the eve, a week before this incident (the loss of “Boeing” – Ed.) the use of these missiles was urgently renewed. And they put again into service. They have not been used for many years. – They were expired. Made back in the Soviet years. But by the urgent order their expiration date was extended. – And on this day they were put on the plane? – They always stood with these missiles. – Tried to let them in the air less frequently – every flight depletes the resource. But on this day, the plane flew. – And came back without them? – Yes. Knowing this pilot a little bit… (quite possibly, when the other two airplanes were shot down in front of him), he just had a frightened reaction, inadequate. Could out of fright or in revenge launch the missiles into a Boeing. Maybe he took it for some other combat aircraft. – Are these missiles with self-guiding heads? – When he launched them, they began to look for a target? – No. The pilot himself finds the target. Then launches the missile, and it flies at the target. – Could the pilot use these missiles against ground targets? – What else do you remember this day? What did the pilot say? – Did this pilot serve there for a long time? How old is he? – Voloshin is about 30 years old. His base is in Nikolaev. They were transferred to Dnepropetrovsk. Before they were sent to Chuguev near Kharkov. And all this time they bombed Donetsk and Lugansk. And, according to one of the officers of the Nikolaev base, they still continue to do so. – Did the pilots have good combat experience? – Those who were there, had experience. Nikolaev base was even one year, in my opinion, 2013, the best base in Ukraine. – Was the story about the “Boeing” discussed among the pilots? – After everyone learned about this “Boeing” what happened to this pilot, captain Voloshin? – After all of this flights continued. And the pilots did not rotate. The same faces. – Let’s try to recap the events. How could it develop? Three airplanes left on a combat mission. They were roughly in the same area, as Boeing. Two airplanes were shot down. 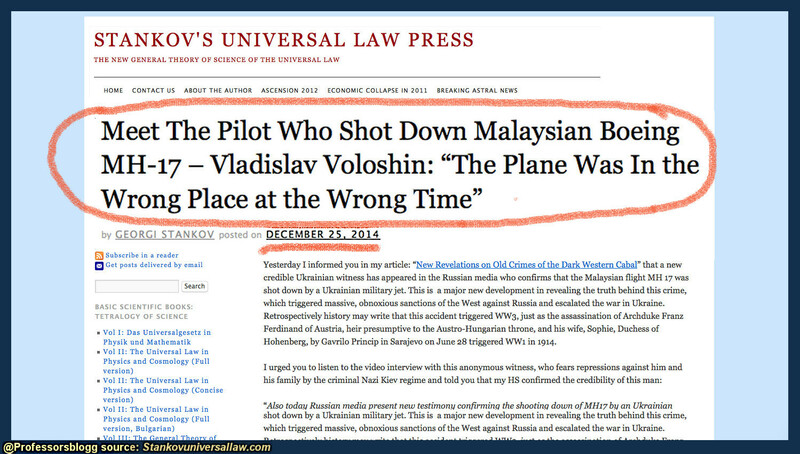 This captain Voloshin was nervous, got scared, and possibly he mistook the Boeing for combat aircraft? – Possible. The distance was long, he may have not seen specifically what kind of aircraft. – What distance do these missiles need? – At 3-5 kilometers they can find the target. – And what is the speed difference between combat aircraft and the Boeing? – No difference: the rockets have pretty good speed. Very fast rocket. – Will catch up anyway? And height? – It may easily at its maximum altitude – to 7 thousand meters – quite easily focus on the target. – To reach it higher? – Yes. The aircraft can simply lift the nose up, and can find the target with no problems and launch the rocket. The range of this missile is more than 10 kilometers. – At what distance from the target does this rocket explodes? Does it hit the fuselage and explodes? – Depending on the modification. Literally could when it hits the body or at a distance of 500 meters. – We worked at the crash site and noticed that the fragments were trapped in the hull of the aircraft very closely. It seemed like it exploded literally two feet away from the Boeing. – There is such a missile. The principle of fragments – it breaks, and the fragments hit. And then hits the main warhead of the rocket. – Ukraine announced that on this day they had no combat flights. We checked different aggregate sources on the downed airplanes, Ukraine denied everywhere that its military aircraft flew on this day. – I know about this. Ukraine also announced that two of these airplanes were shot down on the 16th, and not the 17th. And many times the date was changed. But actually, the flights were on a daily basis. I saw it myself. Even during the ceasefire there were flights, although, less frequent. – What ammunition was on the aircraft at your airfield? Were phosphorus bombs used, incendiary devices? Ukrainian artillery used it very actively on the ground. – I didn’t see phosphorus bombs. But space-detonating bombs were used. – Yes. This bomb was intended for Afghanistan. It was prohibited and was not used until lately. It was prohibited by some Convention, I do not remember, can’t say. This bomb is inhumane, burns everything. Burns absolutely everything. – They were attached and used during hostilities? – Yes. And there were also banned cluster bombs. Aircraft cluster bomb – depending on size can hit a very ambitious target. One bomb covers a stadium. Entirely, the whole entire area – two hectares. – Why did they use such weapons? – They were following orders. And whose order is unclear. – What’s the point of such weapons – scare tactic? – Why did you go to Russia, why decided to tell? Why, finally, no one learned this before? You’re not the only witness! – Everyone is intimidated by the SBU (Security Service of Ukraine. – Ed.) and the National Guard. People can be beaten for every careless word, jailed on any insignificant suspicion of sympathies towards Russia or the militia. I was initially against this “anti-terrorist operation”. Did not agree with the policy of the Ukrainian state. The civil war is wrong. To kill your own people is not normal. And to take some part in it or not, but to be on the Ukrainian side and to be partially involved in this, I don’t want to in the first place! ← Why the ‘case’ against Julian Assange in Sweden should be dropped, and dropped now! Reblogged this on Steven25's Blog.